You don't have to live with the stains on your vinyl tile if you employ a few tips and tricks to remove them. Let the type of stain dictate the method and cleaners you use to remove the stain. A good rule of thumb to follow involves using the most gentle and least invasive methods first and working your way up to stronger techniques as you encounter resistance. If the marks left from work boots and snow boots have your vinyl tiles looking less than new, they're easily enough gone. 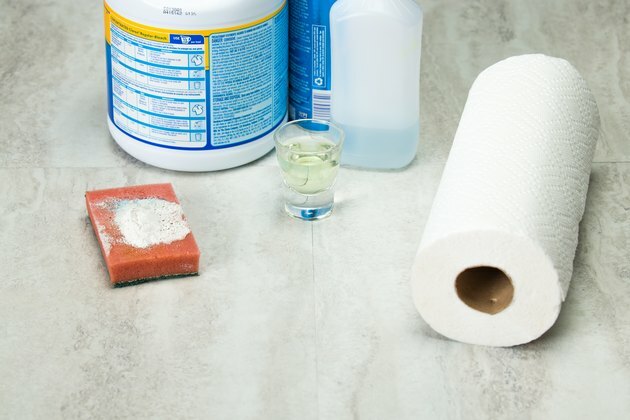 Use full-strength isopropyl alcohol, also called rubbing alcohol -- found in the medicine cabinet and a soft, white cloth to buff the marked area. 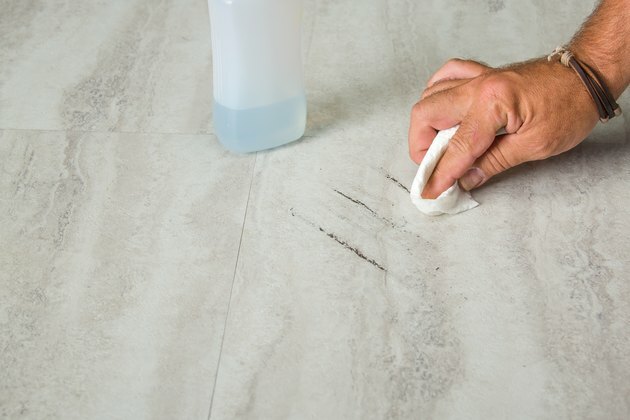 This treatment is safe for most types of vinyl flooring, but if you're in doubt, test the procedure first on a hidden area -- under the kitchen cabinets, for example. Mineral spirits or lighter fluid work on scuff marks too. But do not use these chemicals near open flames, as they are highly flammable. Stains left to linger are always more difficult to remove, especially fruit-based faux pas like those left behind by spilled juice or wine. For easier clean-up, attend to spills right away. If you miss one, don't despair -- a little bit of diluted bleach tackles these types of tough catastrophes. Dilute 1 part bleach to 4 parts water and soak a white cloth in the solution before laying it directly on the stain. Check it once every fifteen minutes or so until the stain disappears. Rust marks from forgotten paint cans, spray cans or other metal objects that were left to linger on your good vinyl tiles are easily enough tackled with oxalic acid. Also called wood bleach, you'll find it in the paint and stain section of your local home improvement store, and in superstores and grocery stores in powdered form. Use it to remove rust stains in much the same way you would use regular chlorine bleach, except there's no need to dilute it. Simply saturate a white cloth and place it over the rust stain. Or sprinkle some powder and scour the area with a soft wet sponge. Let the liquid or paste sit on the stain; check every fifteen minutes until the stain is gone. Wipe clean with a soft wet cloth. Buff dry to remove any haze. 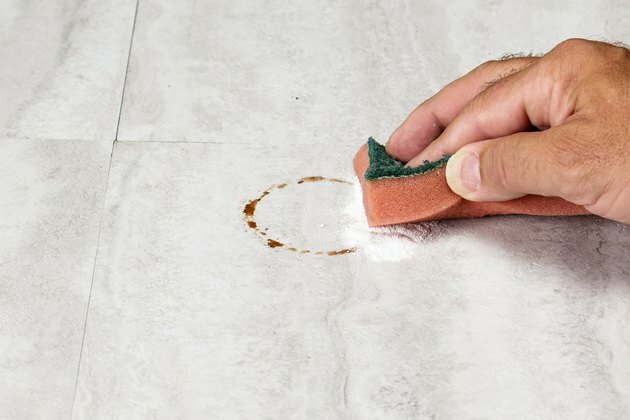 Water stains on vinyl tiles are one of the more stubborn stains you'll face, but it's still possible to remove them. Use the same diluted bleach and water solution that you would use to remove wine. Soak a white cloth in the solution, place it over the stain and follow with a layer of plastic wrap. 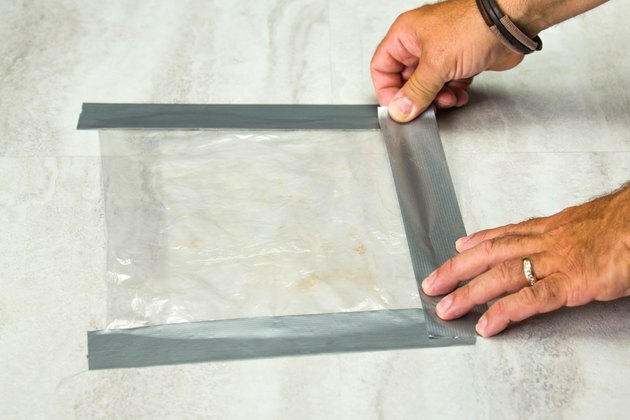 Use duct tape to adhere the plastic to the floor, sealing every seam so no air can escape. Allow the patch to remain in place for 24 hours, and then remove it. Wipe over the area with mineral spirits, and your water stain will be gone. Stubborn, old stains are much harder to remove from vinyl tiles. For this reason, you should wipe spills up immediately and clean problem areas as you become aware of them. 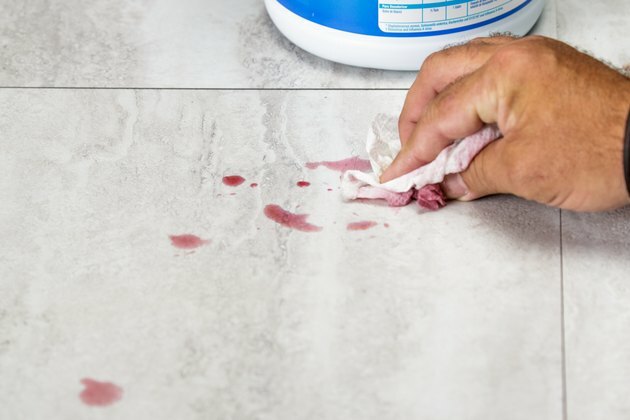 For older, stubborn stains, to eradicate them, use the methods previously listed for the type of stain on your vinyl floor. Repeat the method until the stain is gone. Avoid scrubbing the stain with an abrasive material, as this can remove coloring and patterns from vinyl.